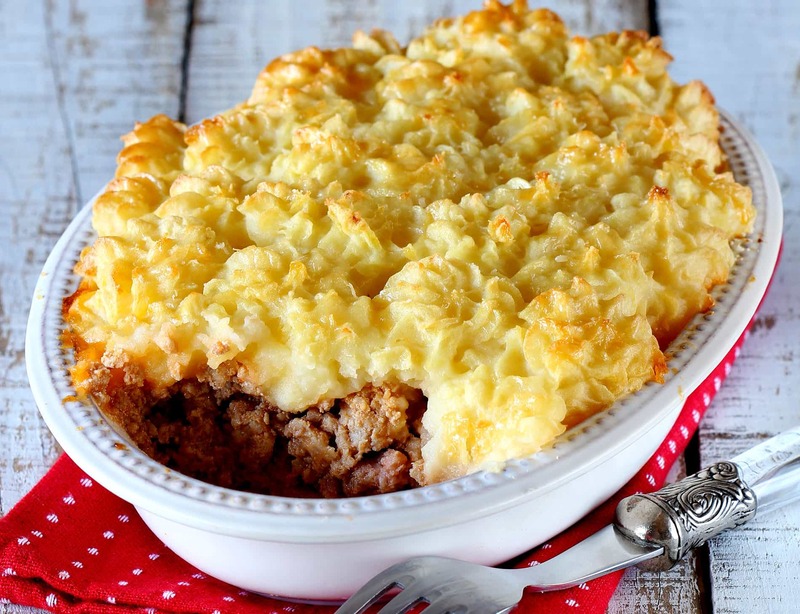 Crisp pastry filled with tasty meat and vegetables- topped with creamy mashed potato. To make the filling, heat half the oil in a flameproof casserole dish over a high heat. Add beef and cook, stirring, until brown. Remove beef (and any juices) and set aside. Add remaining oil to casserole dish. Reduce heat and cook onion, stirring occasionally, for 5 minutes or until softened. Return meat and juices to casserole dish. Add garlic, tomato sauce, ketjap manis, mixed herbs, pepper and ¾ cup water. Cover and simmer over a low heat for 1 hour, stirring occasionally. Remove lid and simmer for 10 minutes longer. Blend flour with water. Add to beef mixture and simmer, stirring for 1 minute, or until thickened. Stir in carrots and peas. Cool mixture. To make the pastry. Place flour and butter in a food processor. Process until mixture resembles breadcrumbs. Add water and process until a ball forms. Lightly knead on a lightly floured surface. Form pastry into a log shape. Wrap in plastic wrap and chill 30 minutes. Preheat oven to 190ºC. Grease six 11 cm diameter pie dishes. Cut pastry into six pieces. Roll one portion of pastry in a circle to fit a pie dish. Gently ease into dish and trim edges. Prick pastry all over with a fork. Repeat with remaining pastry. Place pastries on an oven tray. Press a piece of foil into each pastry case, then half fill with dried beans or raw rice. Bake 10 minutes, then remove foil and beans. Continue baking for 10 minutes or until lightly coloured. Set aside (keep pastry cases in pans on tray). For the topping, boil potatoes until tender. Mash, then add butter and milk. Beat until smooth. Assemble pies. Fill pies with meat filling. Top with mashed potato, then spray lightly with oil. Bake 20 minutes or until potato is lightly browned.